With the closing today of St. Vincent's Hospital, New York City's home birth midwives have found their livelihoods cut from under them. Their pregnant clients, some only weeks or days away from giving birth, suddenly are without care providers. New York State law mandates that home birth midwives have signed practice agreements with either a physician or an institution. St. Vincent's Hospital provided this agreement to most, if not all, of New York City's licensed home birth providers. With the hospital's closing, more than half of the city's home birth providers have been unable to find a new institution or physician willing to sign the agreement and are thus unable to legally practice midwifery. "A midwife should have a lady's hands, a hawk's eyes, and a lion's heart." This phrase on the cover of Lady's Hands, Lion's Heart: A Midwife's Saga captures the essence of Carol Leonard's memoir. An apprentice-trained home birth midwife at the beginning of the American midwifery renaissance needed courage, skill, and highly attuned powers of observation. Several blog readers highly recommended Lady's Hands, Lion's Heart when I compiled a list of midwife memoirs. Readers said that her book was "a terrific read. Unputdownable" ... "an emotional, powerful book. The stories of the women and of the midwife are vivid, passionate and moving." This book, surprisingly, had not yet made it onto my reading list. Clearly, that needed to change. I contacted Carol Leonard about reviewing her book, and she graciously sent me a copy. Since then, we have corresponded on and off. She sends me updates of writing pieces she's working on, elaborates on the stories from her memoir, or tells me about her newest book project The Beauty Girls. Lady's Hands, Lion's Heart is a memoir with two intertwined stories. * The first is--not surprisingly--the tale of Carol's midwifery career in New Hampshire from 1975-1987. After the not-so-great hospital birth of her son Milan in 1975, she was so fed up with the care she received that she left AMA in the middle of the night, yelling after her doctor "I am outta here!" Yes, Carol is one feisty character, and it only gets better. Carol began her midwifery career in an unexpected venue--supporting women having abortions in a women's health clinic. (Today, such women are called "abortion doulas.") Around the same time, she started assisting an old-time family practice physician who attended home births, the only one left in the state. Before she knew it, she was catapulted into a career as a home birth midwife. It was the right time and place; the natural childbirth, counter-cultural, and back-to-the-land movements were going strong. Home birth fit easily into all three. The other main narrative of the book is a love story. As her first marriage is falling apart, Carol falls in love with Dr. Ken McKinney, a handsome, sensitive, dedicated obstetrician whom she works with. Although they sometimes clash over certain obstetrical practices, he proves remarkably open to changing his practice style. This is a good thing, as they eventually marry and work in tandem. Unlike most American home birth midwives, Carol has access to a sympathetic backup OB who is willing to meet her clients at the hospital, no questions asked, night or day. As Carol and Ken's relationship deepens in the book, they face increasing challenges. Carol learns how to work as an independent midwife--sometimes learning the hard way to be more patient or more humble. She also withstands considerable opposition from local physicians and hospitals and creates landmark direct-entry midwifery legislation. Ken's physician colleagues dislike his support of home birth (and his popularity with patients) and eventually give him an ultimatum: stop providing backup to Carol, or lose your job. He leaves his group practice and forms a solo OB/GYN practice that becomes the most successful in town. Lady's Hands, Lion's Heart is a gripping, fast-paced read. Filled with Carol's earthy humor and raw narrative style, you become immersed in the moment-to-moment life of a home birth midwife. Women birth in urban government-subsidized apartments and in quirky off-grid cabins. Carol climbs into tiny lofts, underneath a woman suspended midair, and through a storm of feathers unleashed by a laboring woman ripping apart her pillows. All in a day's work for a baby catcher. Because Thea is so short, she braces herself, straight armed, in the space between the washer and dryer. This leaves her feet dangling about six inches off the floor. This is how she wants to do it--suspended in midair. I on the other hand, am lying on my side, wedged in between both appliances. I am trying my best in these cramped quarters to guide the baby out. The amniotic fluid is dripping on my head. Dryer lint is sticking in my wet hair. I am covered, head to toe, with fuzz galls. When I finally stand up, I look like a gray Yeti. As American midwifery evolves and professionalizes, today's student midwives will likely have different formative experiences than the midwives of the 1970s. Carol Leonard's memoir preserves and documents the soul of American midwifery, including the founding of MANA. For those wishing to learn more about this rich heritage, Lady's Hands, Lion's Heart should be read in combination with Sisters on a Journey: Portraits of American Midwives. Ladys' Hands, Lion's Heart is available through Amazon or directly from Bad Beaver Publishing. "The story spans thirteen years--1975 to 1987-- and is told with three threads. The first thread is the home births and my apprenticeship with the wonderful old country doctor, Dr. Francis Brown, the only physician in the state who still attended births at home. He took me on as his sidekick, and we trooped around the New Hampshire countryside for years while my own practice was blossoming. The second thread is the renaissance of the profession of midwifery in the United States, despite formidable opposition from a jealous medical profession. The third thread is my love story with the impossibly handsome and brilliant obstetrician, Dr. Ken McKinney." I recently spoke with Thomas Balmès, filmmaker of the documentary Babies. Let me recap the highlights of our conversation. In a time when movies and television inundate us with messages--from subtle to blaring--Thomas Balmès' documentary Babies returns to the basics: the joys, adventures, and discoveries of babyhood. Following four babies in their first year of life, Balmès lived with families in Tokyo, Namibia, San Francisco and Mongolia. His film is a cross-cultural voyage through infancy and babyhood from a baby's point-of-view. Balmès did not create Babies with a social or political agenda in mind. "I don't deliver messages," he said. "I am not a postman. I am a filmmaker." With little narration, the film speaks for itself via its stunning imagery and cinematography. Balmès favors long, unedited shots, like the opening and closing scenes in the trailer. Selecting the families was a challenge. At many of the casting locations, he would have more than 100 families to choose from. Both Balmès and the families had to be a good match for each other, as he would live with them for almost a year, capturing their babies' every move on film. Balmès filmed the four babies mostly serially, one after another. Occasionally, the parents shot additional footage themselves. Balmès related that it was especially difficult finding American and Japanese families who were comfortable allowing a filmmaker into their intimate space for an extended period of time. He learned to integrate himself into the everyday life of the families. At times, this meant knowing when to step outside to give the families some time alone. Thanks to the generosity of these four families, Balmès has created a spellbinding documentary. As the camera moves within the baby's point of reference, the quotidian becomes profound. When we see the film, we relive our own childhood. 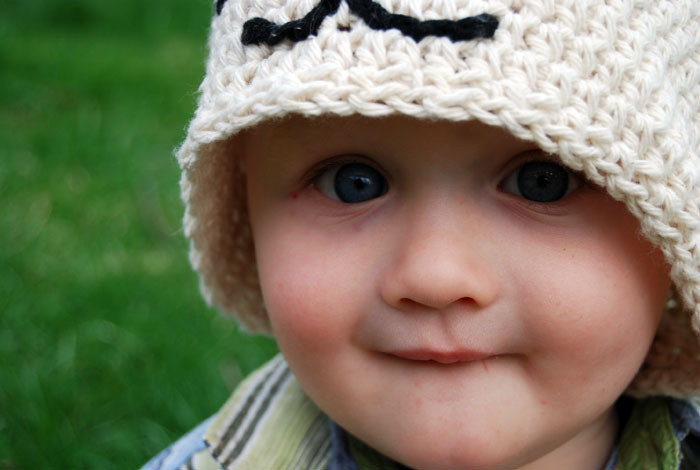 We remember the excitement our own baby's first steps and first smiles. Balmès' next project? Spending time with his wife and three children, the youngest of whom is just 3 years old. For the past few years, he has spent long periods away from home filming other peoples' babies, and now he wants to be with his own family. Babies premieres on May 7th in North America. Click here to find when your local theater is showing Babies. And if it isn't, put in your vote on the Babies widget on the sidebar! The DVD release date has not yet been announced, but Balmès hopes it will be in time for the Christmas holiday season. In the meantime, you can watch this featurette, which includes interviews with Balmès, producer Alain Chabat, and Focus Features CEO James Schamus. What questions do you have for Thomas Balmès? Dio turned one year old yesterday! It's going to be very hard to avoid cliche statements like the time goes by so fast and it feels like just yesterday that he was a tiny newborn because...well... they're entirely true! And I know this next phrase will also sound overdone, but I have been really busy lately. So busy that I didn't even have time to write about Dio's first birthday on the day it happened. (I didn't get back from painting one of our rental apartments last night until 10:15 pm. By time I changed out of my painting clothes, checked my email, folded some laundry, wrote in my journal, and attended to other mundane tasks, I was totally exhausted.) And then tonight I made a really elaborate chocolate cake--one of those complicated recipes involving lots of sour cream and brown sugar and dark chocolate and sifting the dry ingredients together--and it tasted just like a cake mix. So disappointing. In fact, I nixed having a birthday cake/candles/song tonight because I want a dessert worthy of the occasion. Climbing all the way up the staircase when I wasn't watching him. Now that's all he wants to do! His body is lengthening out, and he looks more boyish and less babyish to me. He is becoming more and more confident with walking. Just a few days ago he was taking his first hesitant steps and needed lots of coaxing. Tonight, though, he walked across the room several times at a decent clip. Despite all the reasons for celebration, Dio has been fairly miserable the last few days. He has two new teeth just popping through, a bad cough and congestion, and an on-and-off again low fever. He's been super whiny and cranky and clingy. Today was especially hard for him. He's tired and in pain and I can't magically make it all go away. Maybe if tomorrow isn't as crazy, I will read through Dio's birth story, look at his birth pictures, and watch videos of him as a newborn. 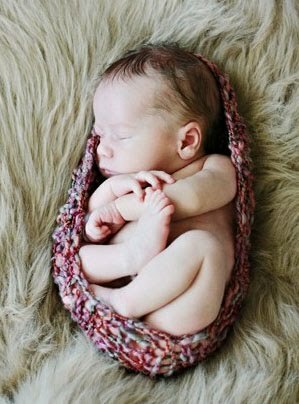 I've come across a few great birth stories that make me want to have a baby again. Which is looking a lot more possible since my period just started, right after my 32nd birthday. It's a birthday present that I have mixed feelings about. I like being period-free. Since January 2006 I have had 4 periods, total. But I am also happy to know my fertility is returning, to know that another baby is now possible. So first off, Amy of Life in Slow Motion just had her second baby, another girl. I first started reading her blog when Zari was a tiny baby. I wish I lived closer to her, because she takes amazing photographs and I'd love to have our portraits and family pictures done by her. Her first baby was a fairly traumatic hospital birth, so she chose to give birth at home the next time. First, read Baby Ada's Birthday (and watch the video, too--it's amazing to see her literally deliver her own baby so calmly and naturally). Then you can read more about the birth at Welcoming Baby Ada. The other stories are all on Birthing Beautiful Ideas--a blog I just discovered and wish I'd found much earlier! After a couple of pushes, Dr. N and Chris helped me to get into a hands-and-knees position so that I could gain the assistance of gravity in my pushing. And then Dr. N turned to my nurse to tell her the following: “Look at how beautifully she’s doing. Look at how natural and normal this is. She’s pushing on her own, and no one is yelling ‘PUSH’ in her face, no one is counting for her.” And you know what? My nurse started to get excited about this birth. In fact, about twenty minutes into my active pushing, she came into the room to remind me of my birth plan and of my initial intention to push in a side-lying position. Although I told her that I felt much more comfortable pushing on my hands and knees, I was so grateful that she had taken my birth plan seriously enough to remind me when I wasn’t following it! A and I snuggled in the water for another ten minutes, and then we moved out to the main room. And my nurse—the one who wanted me the heck out of the tub—was nearly jumping up and down saying, “That was the most amazing thing I’ve ever seen! You are awesome!” ... Later, I learned that about five other nurses rushed into the room to see the woman who had the hospital’s first water birth. Story #2 part II: Not Too Posh to Push (Upright and Spontaneously): A’s Birth Video. BBI shares videos from her VBAC as part of the Lamaze Healthy Birth Practices Carnival on upright and spontaneous pushing. A few weeks ago I posted about Dio's nightcrawling that was keeping all of us from sleeping well. A few days later, I wrote a quick update called Thanks. So what has happened between then and now? The night after that update, I got 2 hours of sleep. Some of it directly because of Dio's wakings, and the rest indirectly because I was so stressed/exhausted/desperate that I literally could not sleep after 1:30 am. I decided that I could not go on like this. Something had to change. Moved Dio's crib into his room and removed the twin mattress. We'd recently started keeping Dio in his room all night, and we resolved to keep that up. Closed both doors connecting our bedrooms, rather than just one, so I wouldn't wake up every time Dio made noise. Ran a fan for white noise in our own bedroom, as well as Dio's, again to help mask all but the loudest crying. I decided that I was not getting out of bed until 3 am or later (with the exception of going to the bathroom). And I was only nursing Dio once. If Eric wanted to tend to Dio at other times, fine. But I was not going to. I still wasn't sure what the plan was if Dio woke up and would not settle down for hours on end--something he'd been doing a lot lately. Would I actually be able to let him cry and cry if it came to that? Would he survive this sudden change in nursing schedules (from twice to once)? Things were at such a crisis point for me that I asked Eric to give Dio a blessing before bedtime. He slept until 4:30 am. I nursed him, put him back down, and he slept the rest of the night. The next night he woke up once at 3 am to nurse, then slept the rest of the night. I felt like a human being again. It was amazing. For the next two weeks, Dio would alternate between waking once between 3-5 am, or waking an additional time around midnight. Still not bad. More and more often at that earlier waking, we'd let Dio fuss for a few minutes to see what would happen. And, amazingly, he'd stop crying, lay himself back down, and go back to sleep. And we're not talking hours of crying here--usually just a few minutes. At this point, Dio usually wakes up just once to nurse, around 3-4 am. And if he does wake up at other times, he gets himself back to sleep fairly quickly. And I've found that I no longer need the white noise in my room. Being in a room so dark that there's nothing to see. Our room, where his crib used to be, is a lot lighter at night. He always wanted to be standing and partying when his crib was in our room (or screaming because he could see me, and it simply would not do to be 3 feet away from me). Midwives and doctors at Tuba City are more comfortable with slow labors and less likely to call a cesarean section for "failure to progress"
Some of Tuba City’s success probably arises from Navajo culture and customs. Couples often want more than two children, but repeated Cesareans increase the risk of each pregnancy, so doctors and patients are motivated to avoid the surgery. Also, Navajos regard incisions as a threat to the spirit, something to be avoided unless necessary. A recent documentary about an Australian woman who has a breech baby vaginally "in the system." Click here to learn more about the story behind the film. I would love to review this documentary, if the filmmaker is interested. If you had the time to read back through the selected posts listed in part I, you might have noticed a gradual shift in tone. During Zari's pregnancy and immediately after her birth, I was on my "honeymoon" phase in my relationship with unassisted birth: a bit idealistic, breathlessly in love with the idea of undisturbed birth as the pinnacle of the birth experience, enraptured and fascinated with the practice. Now, it was still me writing, which means that my pragmatic and analytical selves were still present even when I was strongly advocating unassisted birth. But compared to how I feel now, after a second pregnancy and birth, I would say that my relationship with unassisted birth has settled into a more mature, complex, and nuanced pattern. Towards the end of writing my dissertation about unassisted birth, I was already finding myself critical of certain trends I saw emerging in online UC communities--the trend toward dogmatism, the distrust or even demonization of midwifery, the embracing of slogans (trust birth! breech is just a variation of normal! etc.) that mask the complexity of reality. In particular, the abandonment of education and preparation--and of midwives--in favor of "trusting my body/following my intuition." To be fair, I wonder if some of the things I'm perceiving is just that--a problem of perception. Since I finished my dissertation, I haven't followed online UC communities as closely as I used to. I'm more of a casual browser/eavesdropper now, rather than regular reader and participant. I know that just dropping in on certain messages might not give me the full context of the larger discussion--just as overhearing bits of a conversation is not the same as participating in it from start to finish. Knowing the full context really does make a difference. What I am not doing in this post is disavowing unassisted birth. I am just trying to explain that I feel many different ways towards the idea all at the same time. I do feel less comfortable "promoting" UC than I used to. If a woman hires a midwife or a physician, she can shirk the responsibility of education and preparation, and things will probably be okay--in a "everyone comes out alive and relatively healthy" sense--because there is someone else there with extensive knowledge and training and skills to fill the gap (even if we might debate the usefulness of, say, surgical skills for a normal vaginal birth). But with UC, all of the weight is on you and you alone. There's no one else to catch you if you stumble. I am reminded of one of my favorite professors: ethnobotanist Dr. Paul Cox. He served an LDS mission in Samoa, and his approach when teaching people interested in his church was to talk them out of joining. He wanted them to be 100% sure that they were joining because they had a personal testimony and unwavering belief. If he couldn't talk them out of it, he knew they were really serious. I feel the same way about UC. I think giving birth unassisted is wonderful--but I don't want to talk anyone into it. I don't want to over-romanticize it, or promise women a pain-free ecstatic birth if they just get rid of the midwife/their fears/their doctor/the hospital. I want women to have an undeniable inner knowing that an unassisted birth is right for this baby, this pregnancy. And to have the concomitant desire to do the necessary preparation for giving birth without a care provider present. I absolutely stand by my decision to give birth to Zari unassisted, just as I do my midwife-attended birth with Dio. If anything, both experiences have taught me to trust that inner voice--call it intuition, divine/spiritual guidance, whatever you like--no matter where it takes me. It might sound airy-fairy for some readers, but nevertheless it was undeniably real for me in both pregnancies. I hope I never need to give birth in a hospital, but if I do feel drawn towards that for a future pregnancy, I hope I can embrace that guidance and move forward with confidence. If I didn't feel strongly guided one way or another, I'd probably hire the same midwife if I became pregnant again. I really enjoyed our prenatal visits. Her presence at Dio's birth didn't disturb me or interfere with the birth in the least--of course it helps that she arrived only 30 minutes before he was born! And I do like having someone with extensive knowledge and skills that I can call upon. I would not have access to that where I live if I were planning an unassisted birth and doing my own prenatal care. But I also recognize that my unassisted birth with Zari played a huge role in knowing what I wanted from a midwife and in knowing how I labor and birth. If anything, that first unassisted birth gave me more confidence in myself to be able to labor successfully in many different settings. Stay tuned for part III, in which I respond specifically to Barb Herrera's post The UC Oxymoron. Below is the transcript of the CBC radio program, All In A Day, about breech birth from April 13, 2010. Host Alan Neal interviews Dr. Glenn Posner and Robin Guy. Click here for the podcast and here to listen directly to the show. Transcript typed by yours truly. Alan Neal: A couple times on “All In A Day” we’ve checked in with a group called the Coalition for Breech Birth. This coalition advocates for the natural delivery of babies who are in the breech, or bottom-first, position. The Society of Obstetricians & Gynaecologists [of Canada] reversed it position on breech deliveries last year. They now say it’s safe to deliver breech births naturally in most cases. But a lot of obstetricians aren’t trained in delivering breeches because for years, doctors have been directed to do C-sections instead. Well, this is all slowly changing at Ottawa hospitals. The Montfort Hospital has been delivering natural breech births over the past year, and just recently, the general campus of the Ottawa Hospital started joining in as well. Dr. Glenn Posner is an obstetrician/gynaecologist who’s been trying out his new skills in natural breech delivery. And Robin Guy is the co-founder of the Coalition for Breech Birth. Both join me on the phone. Hello there. Robin Guy: Hi. How are you? Alan Neal: I’m fine. Dr. Posner, I’m going to start with you. Take me back to med school. What kind of training did you actually receive during your residency when it came to breech births? Dr. Glenn Posner: Right. So I graduated from med school in 1999 and started my residency in Ottawa just as Mary Hannah’s trial was being stopped early because they found that there was more risk in the trial of labour group. So basically my welcome to residency in Ottawa was: no more breech deliveries vaginally. So my cohort of residents—we started training about 11 years ago—are, I’ve been saying, the worst-trained obstetricians in Canada! Alan Neal: So no one knew how to do the breech births. Dr. Glenn Posner: Right. We practiced our skills at cesarean section, we practiced on simulated models, but there’s nothing like real hands-on experience. We practiced with second twins that are still acceptable to be delivered breech. We never really got to see a planned trial of labour for breech. Alan Neal: Can you just remind us why this was the policy? Dr. Glenn Posner: We try, as much as we can, to practice evidence-based medicine. There was a trial that was published in the Lancet in 2000 that said that babies that were born by elective, planned cesarean section did better, had less problems, than babies that were born when a trial of labour was planned. Alan Neal: So then the SOGC changes its recommendations, saying it’s okay to deliver breech babies naturally. What happened for you then? Dr. Glenn Posner: [laughs] Right. So I did 5 years of residency. I had practiced at Montfort for 5 years. I started working at the General last year, and they tell us that now it’s okay. Well that’s all fine and dandy, but in my group of 12 obstetricians, there’s only 9 of us who actually are trained to do it. So what happens when somebody comes in in labor on my shift? I want to provide a safe experience to anybody who comes in when I’m working. Alan Neal: So what did you decide to do at the Ottawa hospital? Dr. Glenn Posner: My group has got together and decided that if somebody comes in when I’m on call, I’ll do my best to find one of the veterans to come in and supervise me. And if they’re on call, they’ll call me in to come and watch them. And that way, over the next few years, my experience will kind of get up to speed. Alan Neal: But are the veterans you’re talking about—are they particularly familiar with breech birth? Alan Neal: Yeah. You kind of need the complications. Dr. Glenn Posner: To be a real obstetrician, you really have to be able to get yourself out of a tight corner. Dr. Glenn Posner: Yeah, I actually teach residents how to do breech deliveries. I can teach somebody the theory. I can teach somebody the maneuvers. We have all these fancy names that we call when we try to make sure the arms come out okay, and what we should do, and how to put on these forceps. But it’s totally different when it’s a real person whose baby’s head is trapped, that you have to actually ask for that pair of forceps, and actually put them on a real person. Your adrenaline level is completely different than at the simulator. Alan Neal: Of course. So you attended a birth last week. Alan Neal: What was it like to deliver a breech baby? Dr. Glenn Posner: That was the second one. What made this one really interesting was that we’re trying a new position, where mom is actually on all fours. And it was absolutely amazing. It went great, and I was very, very that my colleague, Dr. Geneviève Rousseau, came in from home on her day off to watch me do this delivery and to be there for me in case I ran into trouble. And that’s why I was calm during the delivery, because she was there next to me. Dr. Glenn Posner: It was crazy. So mom’s on all fours. I could tell by watching her body language that it was imminent. We went to go prepare the operating room. I went and put on a pair of gloves in case we didn’t make it to the operating room. What makes the story even funnier is that Betty-Anne Daviss, the midwife who was helping with this, had just shown me a video from the German experience not 10 minutes earlier. There I am: everybody has left the room to set up the operating room. The next thing you know, the nurse is yelling for me that the baby’s coming out. I come back into the room, and it looks exactly like the video did 10 minutes earlier! Alan Neal: So hopefully you were paying attention to those 10 minutes! Dr. Glenn Posner: I was. This baby is hanging there. Imagine—the bum is out, the legs are folded up, the feet are still inside mom, the head is still inside mom. The baby’s folded in half and just dangling there. And obstetricians really like doing things. We want to help out. But the video said: don’t do anything, just watch and be ready to help out. I’m just poised there between mom’s legs, waiting for this baby to fall out. Then Betty-Anne ran back, and Dr. Rousseau ran back. They’re all talking me through this thing. And there was actually nothing to do! It happened beautifully, exactly like the video. The feet popped out, and then we did this tiny little maneuver [likely the Louwen maneuver] to help out with the shulders, and then the hands came out, and then the head came out. Alan Neal: What is it like waiting? What is that moment like? Dr. Glenn Posner: You know what, this one wasn’t as bad as the first one I did. With the first one, the patient had an epidural, so it took even longer. It’s very hard for an obstetrician to wait. But this one went fairly quickly and afterwards, we’re all on this adrenaline high that this delivery took place and everything went well. I’m feeling bad for all the people that I’ve sectioned over the last 11 years! My own wife had a cesarean section for breech for our second baby, and our second baby would have come out, probably, no problem also. Alan Neal: I’m going to get back to you in just a moment. But Robin, I was wondering what these new practices at the hospital mean for your group. You’ve got doctors who are now training and wanting to find out how to do this. Robin Guy: Well, you know what’s really exciting about this is not just that we’re starting to see vaginal breech births happen more frequently, but that we’re seeing an openness to a change in practice. It has been traditional in North America for women to have been, like it or not, placed on their backs, which actually causes some problems. It increases the likelihood of cord compression during a breech birth. Putting the mom on all fours—we’ve got early data from a group in Germany who made these videos that this [all fours position] is actually a real significant increased safety for the mother and the baby. So to see this adopted and to see the collaboration with a midwife. We don’t like it, but there is professional snobbery. There are women everywhere who are cheering for Glenn Posner, who wasn’t afraid to take advice from a midwife. We’re cheering for you Glenn; we love you! Alan Neal: And the fact that he paid attention to the video, too, that she showed him 10 minutes earlier. Robin Guy: Yeah. We are actually seeing real collaboration obstetricians and midwives and other professionals, working towards real patient care. And that is extremely exciting for women who have been frustrated by a lack of collaboration. Alan Neal: Dr. Posner, you mentioned that you were waiting for births that would have more complications to them in order to learn better. What are some of those complications? Dr. Glenn Posner: Well, when it comes right down to it, the head can get stuck. The whole body is out and the head is still in. If the head is too big to come out that way, then you’re in trouble. We have maneuvers to try to prevent that from happening, and ways to hold the baby, and not to pull on the baby, and then we have a special set of forceps, and where your assistant is supposed to push on the abdomen. The other complications is, if you do pull on the baby, the baby’s arms can actually get stuck behind the neck and make it more difficult for everything to come out. Alan Neal: What do you do in that situation? Dr. Glenn Posner: Well, you shouldn’t have been pulling on the baby to begin with, is what they tell me. But we have maneuvers. Like everything in medicine, they all have names, named after somebody who has invented them. We go through our maneuvers. But the two that I’ve seen were so easy, I really feel like—I don’t know—I’ll have to see 5, 10 nice breech deliveries before I stop calling my partners in from home to help me out, or I stop coming in from home to watch my colleagues do it. Robin Guy: If I can add for just a second, this group in Germany who has been pioneering the hands & knees position in the hospital, they’ve been doing this for 5 years and 400 births. And they have not had to use forceps to get a baby out. Not once. Dr. Glenn Posner: That’s great to hear. Robin Guy: So it’s a big change in practice, if we can convince—we’re trying to get a randomized controlled trial going internationally examining the difference between delivering a breech baby with a woman on her back and delivering a baby on all fours, so we can actually quantify the difference. Having some data there would make a real difference for a lot of people. Alan Neal: That, Dr. Posner, what Robin’s just saying there, that need for data: is that what you’re hearing from a lot of your colleagues as well? Dr. Glenn Posner: Yeah. I find that really reassuring. If they did that many deliveries and never had to pull out the Piper forceps, that makes me really happy. Because I do not want to put on a pair. If I had to put on a pair of Piper forceps tonight to save the baby, my coronary arteries would be squeezing a little too hard. Alan Neal: Are there colleagues who are still saying, “well, we don’t want to do it”? Dr. Glenn Posner: I think that if we do more of this, and it becomes the standard of care again, people just want to practice safely. We all want the same thing. We really do. Obstetricians sometimes get a bad rap for doing a lot of cesareans, but at the end of the day, we want healthy moms and healthy babies by whatever means necessary. Do I do more cesareans, personally, than some of my colleagues who are really good with forceps? I probably do, but I deliver safe babies. And if I do a couple extra cesareans a year than some of the others, I can live with that because I deliver healthy babies. So sure, there are going to be places in town that are more reluctant to do it. Some obstetricians would be more reluctant. And we’re still going to be doing a lot of cesareans. There are a lot of people who are not going to qualify for the perfect breech delivery that we’ve stipulated. We’re still going to be doing a lot of cesareans, but at least in ideal circumstances--especially when people have had babies before vaginally, with good-size babies, who are having good labours--if we can avoid a few more cesareans, that would be great. Alan Neal: Dr. Glenn Posner, Robin Guy, thanks for being with us. Robin Guy: Thank you, Alan. Thanks for the attention to the issue. Alan Neal: Goodbye. Dr. Glenn Posner is an obstetrician/gynaecologist at the General campus of the Ottawa hospital. Robin Guy, the co-founder of the Coalition for Breech Birth. I'm listening to a story on CBC Radio 1 (91.5 FM in Ottawa) about breech births. Dr. Posner and Robin Guy are talking with the program host. Click here to listen! Many of you were right--it was seeds! Laura gets a gold star for guessing "survival seeds." 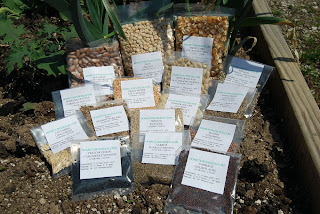 Hometown Seeds sent me their Survival Seeds, a collection of 16 non-hybrid vegetable seeds that can plant up to 3/4 of an acre. 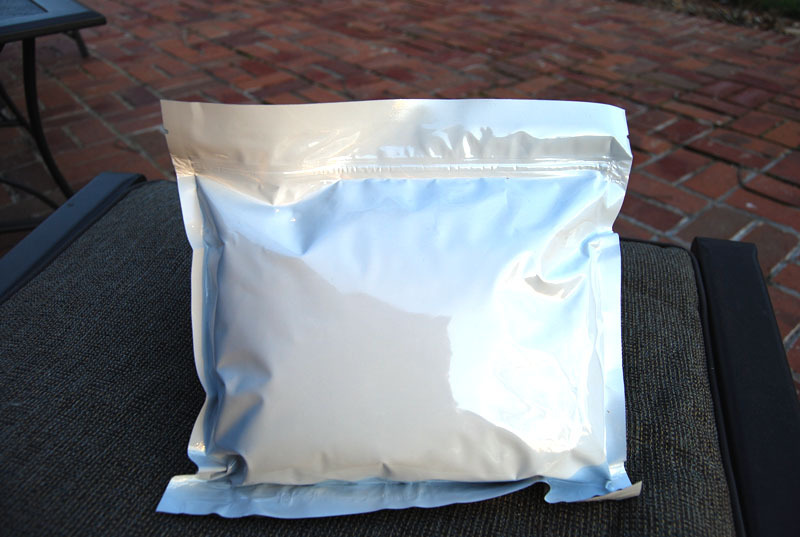 This Mylar-sealed package will keep up to 10 years if frozen and unopened. 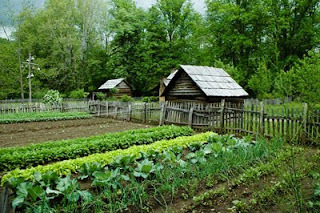 Or, if you want to plant them right away, you can save seeds from your plants, all of which are open-pollinated varieties. Kentucky Wonder Brown Pole Bean: 5 oz. Golden Bantem Sweet Corn: 5 oz. Survival Seeds also come with detailed planting, harvesting, and seed-saving instructions for each variety, arranged by hardiness group. I like that all of the information is in one stapled handout--no sifting through opened seed packets to find when to plant your peas or your beets. 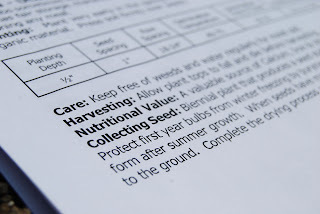 I especially appreciated the seed collection instructions. I had no idea, for example, that carrots and beets were biennials. My own garden is off to a good start. This spring I've already planted peas, carrots, mache, mesclun, spinach, shallots, leeks, garlic, and onions. 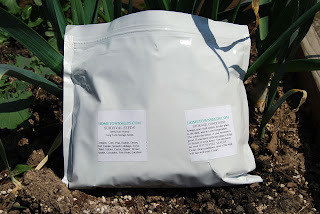 I started two large flats of seeds this week, from Cherokee Purple tomatoes to 95-day artichokes to mystery melons that we liked from the farmer's market. Last years' raspberries, strawberries, blackberries, asparagus, rhubarb, overwintered kale, chives, sage, and parsley are thriving. I'm also putting in a collection of fruit plants: Juneberries, honeyberries, currants, gooseberries, and jostaberries, plus more raspberries and strawberries. I wanted to put in a dwarf fruit tree orchard, but I think I'll have to delay that until next growing season. I'd love to hear about your garden plans/dreams/ideas for this year! I recently received a small package in the mail. Guess what it is? It costs less than $40 but is worth $600. It renews itself year after year. It weighs less than 2 pounds but can increase to hundreds of pounds in just a few months. It is good for the environment and good for your body. The mystery package will be unveiled tomorrow. Gold stars to anyone who guesses correctly! I was happy to read about a recent vaginal breech birth in Ottawa, thanks to ElementalMom. In Giving Birth, the Natural Way, Liz Payne of The Ottawa Citizen profiled a recent vaginal breech birth in Canada. The 2009 SOGC guidelines recommended vaginal breech birth as an option, but as Payne noted, "change has been slow." The problem is that many doctors have never delivered a breech baby and others have limited experience. It had become a lost art. Ottawa obstetrician Glenn Posner began practising after the controversial breech birth study and, as a result, had no practical experience delivering breech babies. He is anxious to change that. On Monday night he helped deliver Lily Luck-Henderson. He says watching a video about how it is done in Germany, with women in an upright position or on their hands and knees rather than lying down, helped. It is time women were given the choice about attempting to deliver breech babies without surgery, he added. "Aren't we supposed to let people make their own choices? It's not the 1950s when you tell people what to do and they say, 'OK, doctor.' "
I love reading these stories of positive change--thanks to "regular" women and mothers like Robin Guy, who founded the Coalition for Breech Birth and helped organize the International Breech Conferences in Vancouver and Ottawa. Barb Herrera's recent post, The UC Oxymoron, got me thinking about my own perspectives on unassisted birth and how they have changed since I first encountered the idea. Stay tuned for part II, in which I will discuss my current perspective on unassisted birth. The owner of Paper Raisins, one of the Writing Contest sponsors, graciously sent me two of her handmade hats to review. I am delighted to feature her work! 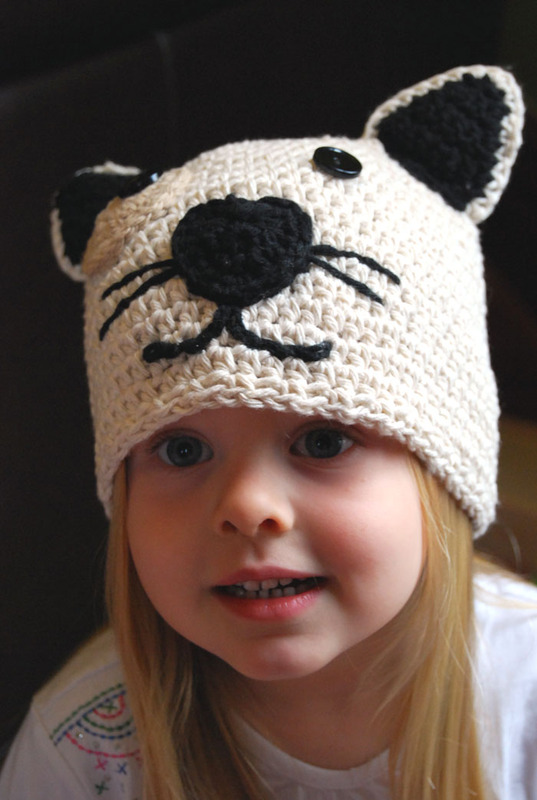 Paper Raisins specializes in hand knit and crocheted hats and photography props. Paper Raisins enjoys creating things in bright to subdued colors, fun styles, whimsical garments and retro 1920's inspired designs. They use natural fibers wherever possible. Paper Raisins loves the unexpected, whether it be color, texture or design. 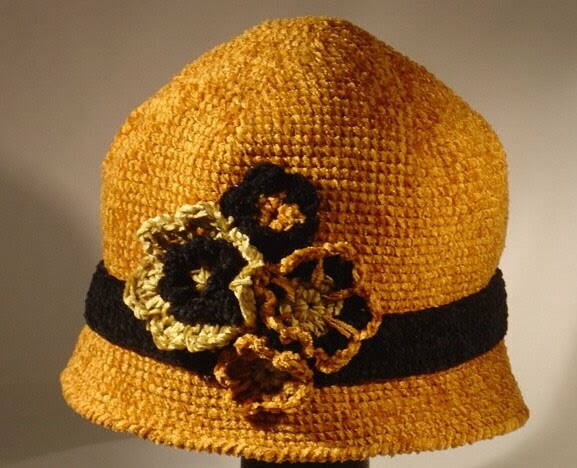 Zari is wearing the ribbon sunhat in natural. Isn't it lovely? 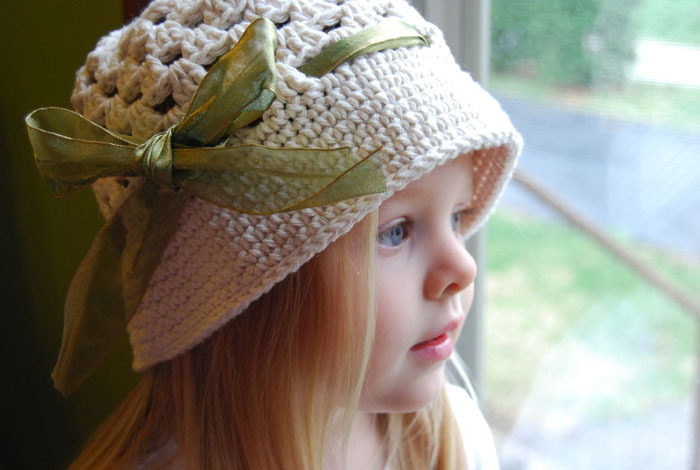 It comes with an olive green ribbon, but you could easily switch the ribbon to match what your child is wearing. 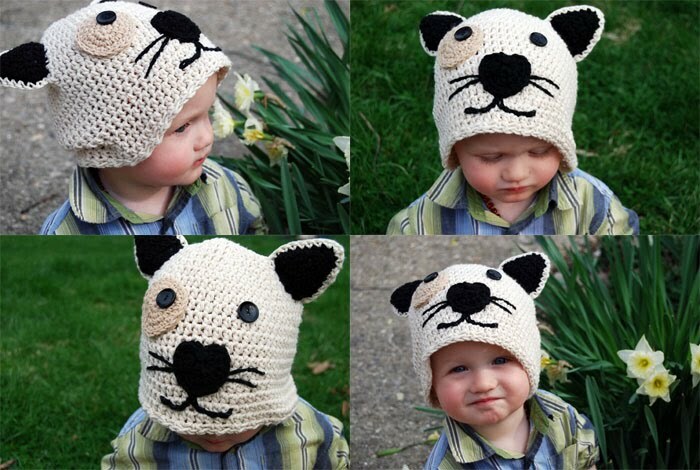 Dio is wearing the kitty hat in natural. I smile every time I see him wearing it. It will make a fantastic winter hat/Halloween costume/dress-up prop. Paper Raisins doesn't just make children's hats and scarves. You'll also find cardigans, ponchos, headbands, and slippers. Hats for yourself. Photography props for newborns. Baby bonnets and caps and newborn hats--plain, with ears, or shaped like gourds...like these irresistible ones. 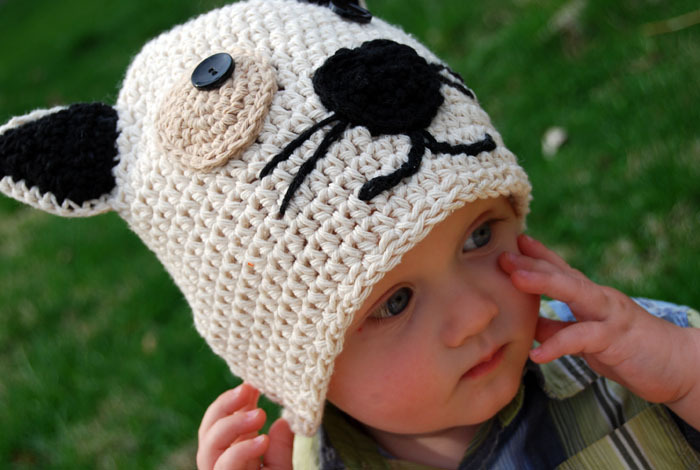 I need another newborn so I can put one of these delightful hats on its head! I love Paper Raisins' 1920s-inspired designs and styles. A note about sizing: Paper Raisins hats are generously sized. Both Zari's and Dio's head measurements fell between sizes, so I ordered the next size up. I should have ordered down. Zari's hat is a tad too big, while Dio is swimming in his kitty hat. My recommendation, especially for the more fitted-style hats: take a very careful head measurement and order the smaller size if there's any question of which to choose. I subscribe to lots of blogs. Too many. I also have Google Alerts set for various search terms. On the days I don't blog, it's usually not for lack of something to write about. It's the other way around, actually--blogging paralysis caused by information overload. Here's a sampling of things that caught my attention today, ones that I bookmarked for later posting/viewing/reading/commenting. Jenne at Descent into Motherhood discussed what birth trauma looks like (and what it does not look like), using pictures from her own two births as examples. I love looking at contrasting pictures of births, such as this woman who had two cesareans and finally, in her words, a "victorious birth after multiple cesareans." Or this link I followed from Jenne's blog to Comparison at Aimeeland. Any other photo/video comparisons you'd like to share? Women in Charge, a home birth midwife's blog, shared two birth stories in one. The mom's first baby was born at home, then her twins were born in a hospital. Nice to read such a great story, but it's one of those lucky stories that many mothers of multiples don't ever get a chance to experience. The subtle and not-so-subtle codes that say it’s okay–admirable, even–to be and talk about being an involved father, but a sign of poor work ethic or inadequate professional commitment to be and talk about being an involved mother. The coding of childbirth and parenting as ‘women’s work’ and as special interests rather than as fundamental elements of human experience and cultural systems. And lots of stuff about breastfeeding--in particular, the recent study in Pediatrics that concluded: " if 80 to 90 percent of women exclusively breastfed for as little as four months and if 90 percent of women would breastfeed some times until six months," the US would save $13 billion in excess costs annually and avert 911 preventable deaths per year. Jenne at Descent Into Motherhood: Vitriol over breastfeeding research. I love the comment that "Ideals are stars to be guided by not sticks to beat ourselves with." Dou-la-la alerted me to a new film, Latching On, and gave some commentary. Bellies and Babies also mentioned that documentary, as well as another one titled My Toxic Baby. Every day is like this...so many interesting things to read share and never enough time to get to all of them! Any bets on next year's number? 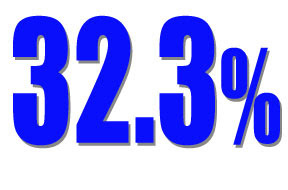 I'm going for 33%. 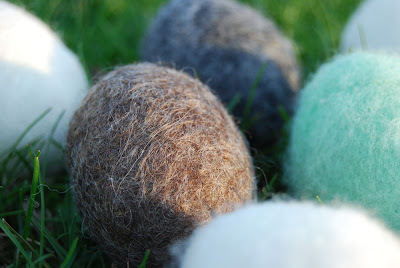 I saw this tutorial for making felted wool eggs (thanks to Amy at Progressive Pioneer for the idea!) and just had to try. I was racking my brain on how to get my hands on some wool roving. I called a friend who knits, spins, and weaves and asked her if I could buy some. She said, "I have so much roving that you can take some! Please!" I came home with a soft, colorful bundle. I followed the tutorial to the letter, except I alternated hot & cold water baths. My friend said it that the alternating heat and cold would enhance the felting process, better than just heat. 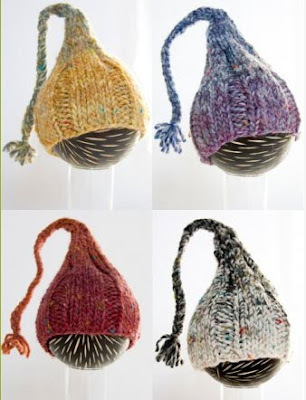 Once they were nice and felted, I strung them inside an old nylon stocking and let them dry overnight. I haven't opened mine up or added any fancy decorations yet. I think I'll leave the plastic eggs inside. The children like playing with them and they'd get smashed out of shape if they were hollow. I'd like to make this activity an annual Easter tradition. 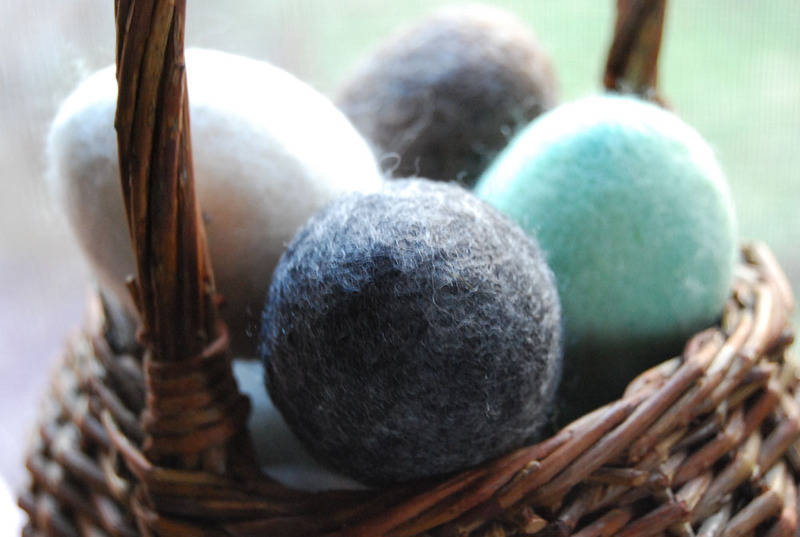 The eggs are fun to make; once you get the felting started, little helpers can go to town dipping and splashing and rubbing the eggs. 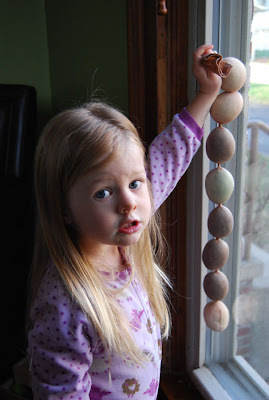 They are time-intensive, though; you'd need to allocate most of a morning or afternoon if you want to make several. I've received so many comments on my Nightcrawlers post that there's no way I can respond to them all individually. So I'm writing this to say thanks and to clarify or elaborate on a few things. I think Dio is getting the right amount of sleep. He has about 12 hours at night and then 2-3 more during naps. He's definitely ready for bed when he goes down around 6:30 or 7 pm, but not so overtired that he's wired. Zari has the same sleep schedule, minus the nap. The nightcrawling began several weeks ago--long before I switched him from 2 naps to 1 last week. I did this in preparation for when we'll be in France in May and June, since we'll be out of the house doing things every morning. Plus he had just started having real troubles going down for his naps--wasn't quite tired enough, especially for the afternoon one. With just one nap, he sleeps about the same amount total as he did when he was taking two. I don't think his behavior is sleepwalking/sleepcrawling. 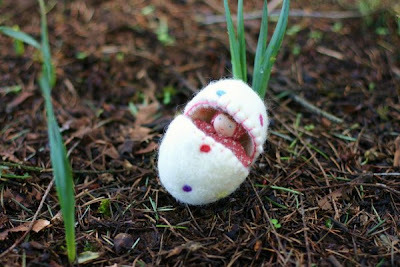 Rather, once he wakes up at night, he starts to crawl (rather than crawling and being woken up by it). I am pretty doubtful that Dio has food sensitivities. I know that some people's babies truly do have them, but frankly I think that number is pretty small. Plus we have no history of food allergies in either side of the family, plus I haven't been eating anything new recently. My problem isn't with getting Dio to sleep. He goes down super easily for both naps and bedtime. I nurse him, lay him down, then leave the room when he's still awake. He usually babbles for a few minutes, then goes to sleep. Sometimes he fusses before he falls alseep, but that's becoming more and more rare. In one sense, he's had to CIO for naps--because I couldn't always attend to him and Zari at the same time. Since he was little, I've often had to lay him down for his nap when he was still very much awake to help Zari with something. He learned pretty quickly how to fall asleep on his own by necessity! One of the hidden blessings of a second child: they learn to be more adaptable than the first! Like I mentioned earlier, Zari never once fell asleep without nursing until she was 18+ months. I am reluctant to totally night-wean for several reasons. The top two are that I enjoy the comfort and contact, and that I really really enjoy my lactation-induced amenorrhea. I suspect that if I night-weaned, my period would come back much sooner. Of course, if that's what he naturally falls into, I probably wouldn't force him to nurse at night! Dio is super, super sensitive to any type of stimulation when he's sleeping. The slightest noise will disturb him. The less I can bother him, the better. So no diaper changes (yay for Fuzzibunz! ), no rocking or patting, etc. He's been staying in his own room and bed all night for several days now, and I think it's been helping. When we do go in to calm him down, we lie down beside him and gently hold him down until he relaxes and falls asleep again. Last night's sleep schedule went like this: bedtime around 7 pm, Eric settled him down at midnight, I nursed him around 3:30 am, and he woke up at 7 am. It was the first time he didn't wake up at 5 am, which was quite nice. I think I'm going to start using this schedule (ie, not nursing at midnight, but waiting until the next waking, since that seemed to help eliminate the extra 5 am waking). Two days ago at naptime, after Dio was jumping in his crib when he was supposed to be sleeping, I came back in his room, laid down on my bed, and read a book. The next time he started to get up, I said sternly, "Uh uh uh, lie down." His head hit the pillow immediately. When he tried getting up again, I repeated my statement. He dove for his pillow again. It became very obvious that he knew exactly what I meant! And actually, that night, he slept very well. I woke up with a start at 1:41 am and realized that he hadn't woken up yet. I checked on him and he was sleeping peacefully on his stomach. And then I lay in bed for an hour unable to sleep. And then finally, I got up and nursed him just so *I* could get back to sleep! He's better at getting back down from standing or crawling to lying back down, and it seems to have helped his nightcrawling quite a bit. We've found him sleeping on his stomach a lot the last few days, something he's never done before. So perhaps we're on the tail end of the nightcrawling?